Mike is a visionary leader known by employees and customers alike for his authentic, engaging, and straightforward communication style. Mike enjoys the opportunity to meet with existing and prospective customers to understand new ways the bank can make relationships grow and prosper. Mike currently serves as Chairman of the Board and Chief Executive Officer of Citizens National Bank. He has been the CEO since 2004. 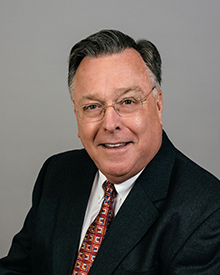 Mike joined the bank in 1992 as the Branch President of the Rockdale Texas banking center. His banking career began in Austin, Texas in 1974 while attending The University of Texas. During this time, Mike got to see the interworking pieces of community banking and decided to focus his career in that direction. During his tenure at Citizens National Bank he has been a significant contributor for the growth and strategic direction of the bank. Since joining, he has been instrumental in growing the footprint of the bank to the current branch network. Bank products and services have also expanded during his leadership. Mike graduated from The University of Texas. He has also graduated from the Southern Graduate School of Banking. Mike is a firm believer in giving back to the communities that the bank serves. Whether it is financial support or giving his time to take part on various community boards and committees, he thinks these activities are vital. Mike encourages all the bank employees to do the same. During time away from the bank, Mike and his wife can be found on the Texas coast, their Hill County lake house, or working around their home in rural Milam County.